New York - More than a year after the announcement of his appointment, and three months following his arrival in his new office in New York, Rabbi Steven Weil, today, July 1, 2009, officially assumes the position of Executive Vice President, the chief professional officer of the Orthodox Union. In that capacity, he will have day-to-day responsibility for running the largest Orthodox synagogue umbrella group in the world, overseeing its staff and programs, maintaining fiscal responsibility, and above all, projecting an image of leadership and vision throughout the Orthodox Jewish community worldwide. He succeeds Rabbi Dr. Tzvi Hersh Weinreb, who has served the OU with great distinction since 2002, and who assumes the position of Executive Vice President Emeritus, in which he will have the opportunity to use his towering learning to write and speak on issues of significance to the Jewish world. Since the announcement of Rabbi Weil’s appointment, in April 2008, Rabbi Weinreb has served as a mentor to him and the two of them have continued to build on their long-standing friendship. Rabbi Weil takes over an organization that operates a dazzling variety of programs, including its network of synagogues; initiatives for youth (NCSY and the Jewish Student Union); for individuals with disabilities (Yachad for the developmentally disabled and Our Way for the deaf and hard of hearing); for the Jewish family (Positive Jewish Parenting and Positive Jewish Marriage); for its community members via its Department of Community Services; for Orthodox students on secular college campuses (the Heshe and Harriet Seif Jewish Learning Initiative on Campus); for the people of Israel through the Seymour J. Abrams OU Jerusalem World Center; and for input into federal, state and local government through its Washington-based Institute for Public Affairs. Even before the economic collapse, the OU was very active in finding meaningful work for the employed and underemployed through its Job Board; its initiatives in the economic field are now growing seemingly by the day to cope with the crisis. The organization’s various messages are transmitted worldwide through its primary website, www.ou.org, and a host of other websites representing its various departments. And of course, there is OU Kosher, the largest and most well-known certification agency, whose famed OU symbol is the standard for kosher designation the world over. All of this is enough to keep Rabbi Weil busy. He’s been diligently training for the job, most recently in the Golden West. 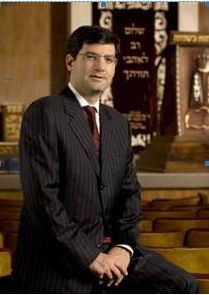 Rabbi Steven Weil, 43, comes to the OU after eight resoundingly successfully years at Beth Jacob Congregation in Beverly Hills, CA, the largest Orthodox congregation outside of the New York metropolitan area. Prior to that, he served for six years as Rabbi of Young Israel of Oak Park, Michigan, in suburban Detroit. Both are Orthodox Union member congregations. A man of great personal charm, Rabbi Weil has gained a reputation as a gifted orator, weaving inspirational messages of contemporary relevance into his teaching of traditional texts. In his new position, Rabbi Weil will be reaching out to the surrounding community, with two specific areas of concentration in the Orthodox world and beyond. “The first major area that the OU team will be working on is adolescent kiruv (outreach), which has two components: NCSY throughout North America and the 10,000 unaffiliated Jewish teenagers in public high schools who attend the Jewish Student Union every week,” Rabbi Weil declared. Rabbi Weil has made a strong impression on leaders in American Jewish life. Undoubtedly, this was exactly what was in the minds of OU President Stephen J. Savitsky and the OU Executive Committee members as they conducted the six-month national search that brought them to the door of Beth Jacob Congregation. There they found a unique individual whose background and resume would not exactly be considered standard in the world of the Orthodox rabbinate. Raised on a cattle farm outside of Buffalo, NY, thereby growing up in a rural environment lacking the Jewish educational institutions necessary to live a fully observant lifestyle (the Weils were the only Jewish family within a 40-mile radius), young Steven migrated to New York City at age 14 to attend Ohr Torah High School; following a year in Israel, he proceeded to Yeshiva University and then to the Rabbi Isaac Elchanan Theological Seminary of YU, where he received semicha – rabbinical ordination. At the same time, he pursued an MBA in Finance at New York University, utilizing the New York City subway system to shuttle back and forth between the domain of the Book and the domain of the bank book. Both congregations grew in striking fashion, as word went out that a charismatic young rabbi was turning the local synagogue into the place to be, with its clubs, educational programs, youth activities, and sermons that warmed the heart while educating the mind. All of this happened while the MBA rabbi was solidifying the shuls’ financial position, thereby providing an insight into what he is being called upon to accomplish at the Orthodox Union. Since arriving at the OU on April 1, Rabbi Weil has been traveling constantly, visiting OU congregations across the country. These trips have taken him to Boca Raton and Hollywood in Florida; Atlanta, Cleveland, Chicago, Seattle, Baltimore, Washington/Silver Spring, Dallas and Denver; plus sessions spent with OU colleagues in Lakewood NJ, learning from the leadership of the world’s largest Torah educational center, Beth Medrash Govoha. He has spent considerable time with the leaders of AIPAC, studying the organizational model from what many consider American Jewry’s best-run organization. Today, as he officially begins his OU position, Rabbi Weil is in Israel, inspecting the OU’s many programs there with the organization’s lay and professional leadership. Following his travels, Rabbi Weil has flown home to California to observe Shabbat with his wife, Yael, and their seven children. When in New York, a packed suitcase often adorns his office, as he prepares for his next journey on behalf of the Orthodox Union. He’ll be taking lots of them in the years ahead. May Hashem guide you in your new endeavour! The Jewish community in general and American chareidi Jews in particular think that the OU is just OU Kosher. OU Kosher is the funding part of the OU which basically pays for the multitude of extremely important community service that the OU provides to American Jewry. We shouldn't even contemplate what American Jewry would look like with the services of the OU. Ranging from NCSY to Yachad, the OU provides very important support to so many Jewish people. Rabbi Weil brings an enormous amount of practiaclly needed resources in his vast experience in social services, both material and spiritual to everybody around him. Good luck Rabbi Weil and may Hashem grant you hatzlocho and may you be matzliach beyond your dreams. Kol hakovod to Rabbi Weil. He embodies all of the best attributes of the modern orthodox community and will serve as a role model and effective spokesperson for orthodox yiddin throughout the world. We wish him hatzlacha in all his endeavors on behalf of klal yisroel. Does anyone know if Raymond Weil from the watch company is Jewish ? And if yes from where? Do you mean an Jewish name like Antiginos? Or Abayah, Rava, Huna, Bibi bar Abayah? Or Onkelos? Or Saadyah? Or Hai? Or Getzel, Shmeril, Kalman, Issac, Zalman, etc etc etc... Get the point? “ Does anyone know if Raymond Weil from the watch company is Jewish ? plus a "chasimas zokon" which clearly defines 'an ehrliche yid'. So, Berel and Leib and Mendel and even Alexander (which don't have Biblical origins) should not be allowed???? What should we tell Tzirel , Goldie, Pessel, and Raizel? You are such an am ha'aoretz. What is a "jewish first name". Most jews in EY including many of the gadolim had first names adopted form eastern europe or elsewhere. Get your head out of drech and focus on substance. To all of the clowns critisizing #6. Please think.how would you react if a new Rebbe like gerer came out as rabbi steven??????? It just doesn't fit Jewish names don't go by the torah, they go by names that were accepted by the jewish community. And although origins from many names might not be jewish, #1 who said its right #2 these names were accepted. The yidden were freed from eygpt in the zchus gadol that they didn't change their NAME, dress, and tounge. So yes he should not call himself steven. Sometimes we want to be open minded and say this is ok and that's fine but being too open minded can have your brains falling out and not being able to think straight. I think you are missing the point. A Jewish name doesn't have to be a Hebrew name, but I'm sure he isn't called up to the Torah as Steven Ben Yaakov. A Rabbi has an opportunity to encourage others to be proud of and use their Jewish names, at no real personal cost to them (they are Rabbis after all), and it is a shame when that opportunity is passed up. Saadiah and Hai are Hebrew And Shmerel is short for Shmarya, which is Hebrew..
Hatzluchah Rabbah to the Rav and everyone at OU. Personally, I am an Agudah supporter, but I appreciate all the good the OU does. Rav Weinreb should be gesundt in his retirement and enjoy his mishpucha and his place in Yerushalayim IHK. its not a "life" position. he retired or his term was up. nothing more and nothing less. Yes, from Switzerland. But I don't know if it is still in Jewish hands. I grew up in Memphis, TN, where his wife Yael is from. Every member of the Spiegler family is brilliant, sincere, kind, and true ovdei HaSh-m. We need leaders like this in these challenging times. Mazel Tov, Rabbi, and may you go from strength to strength! I have thoroughly enjoyed Rabbi Weinreb's Kinnos on Tisha Bav, live, and hope he continues for many healthy years. Reb moshe feinstein's stationary and letterhead was printed with the words "Rabbi Moses Feinstein" on it. 'nuff said. get a life, all of you. Reb moshe feinstein's letterhead and stationary said "Rabbi Moses Feinstein" on it. check any sefer that has a handwritten haskama form him - its right there in bold print. Who needs a dictionary? They are ordinary Hebrew. How is Saadya different from any other Hebrew name made up of a verb plus Hashem's name? And what Arab name ends like that? The Arabic equivalents end in "lah"; e.g. the Arabic form of Ovadya is Abdullah. And how on earth can you claim with a straight face that Hai is not Hebrew?! I am just very curious what his Hebrew name is as his lectures are so good!